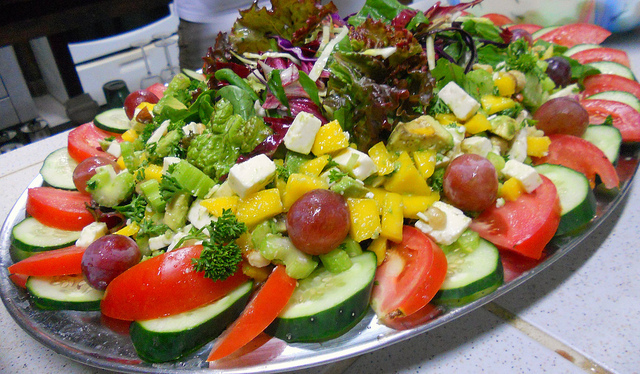 Home » Blog » What Makes a Perfect Thai Wedding Menu ? What Makes a Perfect Thai Wedding Menu ? Thai weddings are kind of like a festival that is commemorated for three or four days in many places. There are many aspects to a traditional Thai wedding; however, not all of these traditions are maintained today. Thai weddings are amazingly great, but are essentially non-religious despite the fact that monks may be present during the ceremony. No special vows are made, but a large amount of symbolism is conducted to ensure good luck to the newlyweds for a happy and successful married life. Apart from the bountiful cultural activities, Thai Food is specifically vouched for its lusciously delectable Authentic Thai food which is the centre of attraction among guests. They get an opportunity to indulge in uncountable kilos of Thai dishes that makes a pretty impressive menu. Whether you are a vegetarian or non-vegetarian or a dying heart fan of lip-smacking dessert, Thai wedding cuisine satisfies all taste buds. 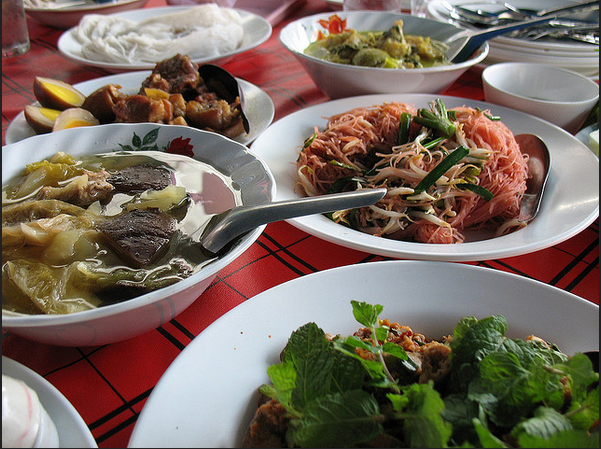 Here is a list of dishes which you are bound to find in almost all Thai weddings. If you are planning a menu for your own wedding or that of a friend or relative, below are essentials which will definitely please all diners. 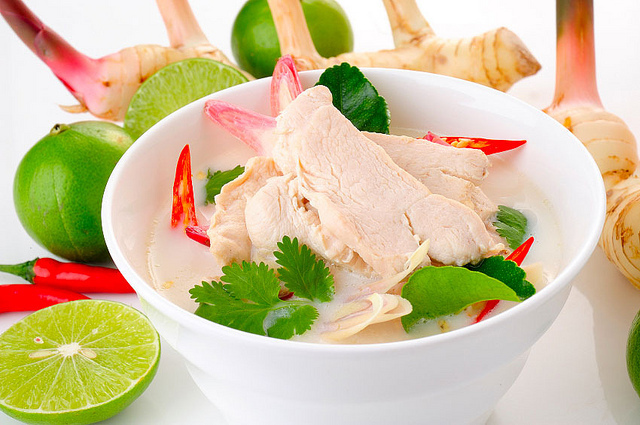 A classic Thai chicken soup, which gets its finger licking rich flavor from the quintessential Thai ingredients including- coconut milk, lemongrass, chili paste, fresh ginger, lime juice, basil and cilantro. It’s a major highlight of all Thai Weddings. As salad is the basic companion of every food served on the plate in Thai weddings, Yam Sam Klop, the mixed mango salad helps to create a perfect menu. Fish is a common non-veg item which could be found in any menu, Thai wedding cuisine also goes hand in hand with this amazing mouth-watering item. Bplaa Pook Pad Pak Gadong (fish with sour cabbage) is one out of those common fish recipes. Kaeng Matsaman, a thick, Indian style curry containing coconut milk that is usually of stewed beef or chicken. 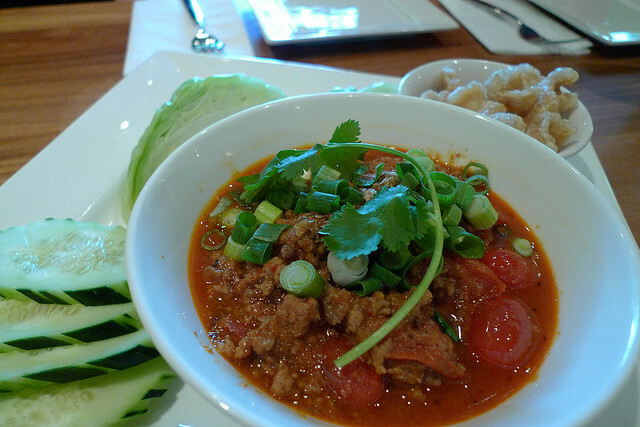 This curry contains roasted dried spices that are rarely found in other Thai curries. Khanom Kareaw- Woven together within sweet bread, Khanom Kareaw is served at a wedding to symbolize the blessing that the newlywed couple will be together forever. 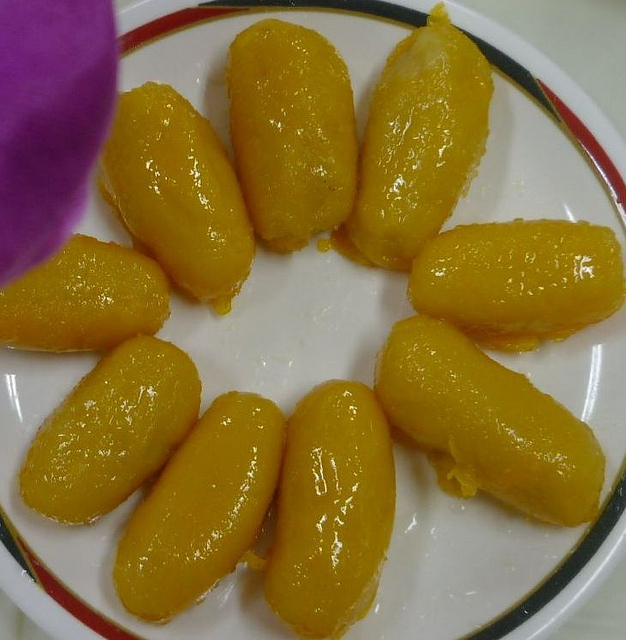 Khanom Tuay Foo- It’s a light and fluffy dessert that is made of sugar, baking powder, rice flour and food coloring along with some jasmine for added aroma. It symbolizes the growing strength of love and the strong relationship between wedded couples. Met Khanoon- Made of split mung beans, eggs, coconut cream and sugar in a brass wok, during a Thai Wedding it is prepared to symbolize that the wedded couple, throughout their life, support each other and will never lose sight of their dreams.